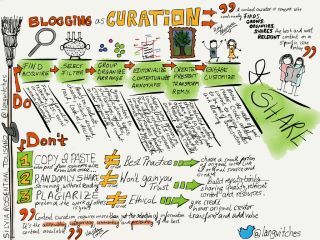 I have written about curation before using Twitter as a Curation Tool and about the importance of helping our Students Becoming Curators of Information. Sue Waters also just published a very comprehensive Curation: Creatively Filtering Content on her blog. Consciously becoming the curator for others for a particular niche, area of expertise or interest. Disseminate resources with added value, put in perspective, create connections, present in a different light/media/language. This is the difference that separates the “collectors” from the “curators”. Establish yourself as an expert, by sharing selected quality information freely. This is when YOU become the trusted member of a network that funnels QUALITY / FILTERED information to others. Collecting, organizing, connecting, attributing, interpreting, summarizing the vast amount of information that comes across your desk/ feed /books/articles/etc. for YOURSELF! Taking advantage of a network of curators working for you (building your own customized network), consuming their curated information. Real time curation allows you to be part of an event, that you physically might not be attending or being on the opposite end allows you to be the bridge for others to participate at an event where you are present, but your network is not. The same uses apply to blogging as a curation tool with the difference that blogging allows you greater freedom in terms of length, presentation formatting and design, as well as connecting and hyperlinking. Group, Organize & Arrange Group content to specifications, topics, similarities, opposites, specific criteria. Arrange content in a new light. Use tags and categories on blog, to group similar posts together I start a blog post in draft and add as I go along, as my train of thought moves, as a find more resources. I copy /paste and re-arrange quotes, links, etc. Create, Present, Transform & Remix Use selected content ethically to remix, add value and transform the original. Add value to your network by contributing original work. I try to create something new for every post: a mindmap, a sketchnote, an image, a slide deck, an infographic, a video, etc. Engage & Customize Know the needs of your readers. Create and arrange your content to engage readers to be part of the conversation and learning. Although my blog is primarily a platform for my own writing, learning, organizing, archiving and processing of information, I do write with an audience in mind: educators. I try to engage readers to contribute, add value and connect their own learning as part of a crowdsourced effort of redefining learning and teaching. Don’t simply copy and paste entire articles from other sites with the intent of “collecting” interesting and relevant work from many different sources in one place. It is not considered best practice among the blogging community. A better way would be to choose a relevant, short portion (quote) of the original work and link to the original author and blog to encourage readers to click in order to read more. I constantly rely on specific curators for certain topics or issues in my network to feed me quality and RELIABLE information. Don’t randomly sharing a large amount of links in a rapid fire sequence or in a looong bulleted list of links -it's collecting, not curating. Most of the time, it is seems that “link collectors” just skim over the titles and at most a few sentences of the resources without reading, nor digging deeper into the content. It is by sharing quality and relevant content and by adding value to make me see connections, new background information or a different perspective I had not considered, that curators will gain my trust. How do you use your blog as a curation tool? What is your niche? How do you become a trusted curator for your area of expertise in your learning network?